"Hora 0": Tensions are rising as Sunday's controversial vote nears. 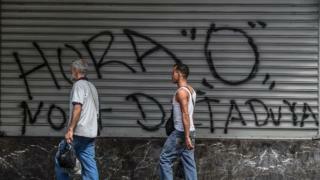 Venezuela's opposition is calling it "Zero Hour". Analysts refer to a breaking point. It is clear to everyone that Venezuela is in crisis, but there's no easy way out. Divisions in Venezuela run deep. The opposition has been vocal since Hugo Chávez came to power 18 years ago, but problems have become more acute under President Nicolás Maduro, a leader who does not have the following that his predecessor did, and under whose watch the economy has been pushed to the brink. When the Supreme Court at the end of March announced that it would be taking over the powers of the opposition-controlled National Assembly (a ruling that was subsequently reversed), tensions rose. 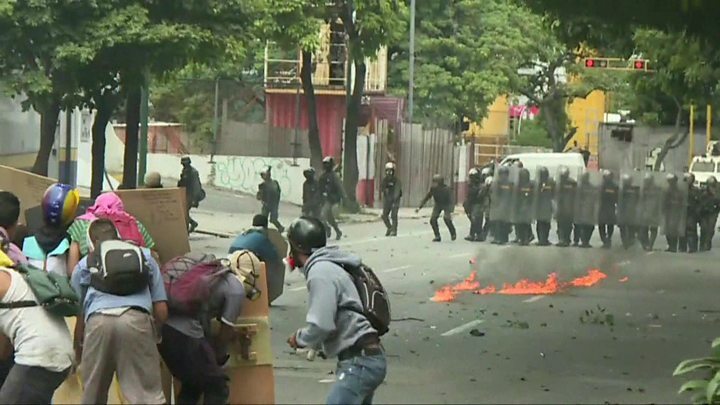 Protests have only intensified in recent months as the opposition has called for President Maduro to go. The government now wants to create a constituent assembly. Essentially its purpose will be to rewrite the country's constitution. It is a move that the government says will enable the country to be at peace. But the opposition says it is anti-democratic and feels it is just a way for President Maduro to consolidate his power. "A constituent assembly is something that could be positive," says Professor Miguel Tinker Salas of Pomona College, California. He argues that if it can take steps to address violence and reform the economy that is heavily dependent on oil, something positive could come out of this. "But in this context, I just don't see how that might happen." as a way to re-energise "Chavismo", the socialist ideology of former President Chávez or as a way to build parallel institutions to the ones already in place and that are controlled by the opposition. "Either way, the constituent assembly will likely be retrospectively considered the single biggest miscalculation of Maduro's presidency," says Prof Buxton. "It has divided the ruling PSUV (United Socialist Party), alienated moderate Chavistas, further encouraged radical voices calling for the government to be overthrown and is unlikely to galvanise mass participation, in turn further discrediting and delegitimising Maduro." The opposition says the country's democratic institutions are being challenged. In the past few months, it has created a strategy to try and disrupt President Maduro's leadership, to try and force the government to change. But despite general strikes, the protests and the recent unofficial referendum, which rejected the constituent assembly, the government remains in power. One of the problems the opposition faces is that it is not one unified party. The Democratic Unity Roundtable (MUD) is an alliance made up of several opposition groups, many with different aims. That does not help their cause. As one Venezuelan told me at the unofficial referendum earlier this month, the opposition could write a textbook on what not to do to get rid of a government. It has been 18 years of trying to bring about change and to little avail. "I think they (the opposition) have this same problem that the government has," says Prof Salas. "It's a brinksmanship approach, all or nothing, there is no process of negotiation, there is no view of conciliation, there is no view of transition." Under US President Barack Obama, targeted sanctions on individuals were introduced. Donald Trump's administration has said it will consider further sanctions. But anything broader than targeted sanctions would be a serious blow for the country's crisis-stricken economy. Oil revenues account for 95% of Venezuela's foreign earnings. Venezuela may have the largest oil reserves in the world but they are heavy crude reserves and the country needs light crude from the US to be able to process it. "Close off several hundred thousand barrels of oil a day, which is what the US is buying, and you are actually hurting the Venezuelan people, you're not hurting Maduro," says Prof Salas. It could also have other unintended consequences, says Prof Buxton. "It will exacerbate existing anti-American sentiment," she says. "Sanctions have negligible record of success, and neighbouring Cuba should be a caution as to the utility of sanctions." Despite the threats of sanctions and the warnings from international leaders, the government is confident that the vote will go ahead. The opposition is doing all it can to make sure it will not. "At this moment it's really too toxic to really talk about the details of how to engineer some type of orderly transition," says Michael McCarthy, a research fellow for the Centre for Latin American and Latino Studies at the American University in Washington DC. "That's the reality and there's a really strong reflexive reaction to talk of dialogue or negotiation." But while the political anger plays out, the economic problems get worse. For people dealing with the reality of food and medicine shortages and spiralling inflation, a solution needs to come quickly. "The real problem is that the government has been trying to hunker down, but the fundamental reality is the shrinking economic pie and how many problems the shrinking of that economic pie will create for Maduro's ability to manage his political coalition," says Mr McCarthy. "That's what resilience is about at this point."